A jetset lifestyle doesn’t have to be all private planes and decadent digs. In Paste Travel’s Jet-Set Bohemian series, we blend the best of high and low for just the right balance … enticing everyone from backpackers to luxury boutique hotel lovers to come along for the ride. On Saturdays at the Old Biscuit Mill in Cape Town, South Africa, the red-brick 19th century mill transforms into a marketplace with over 100 young, local artisans displaying their handmade jewelry, leather handbags and craft chocolate in stands along the cobblestones. 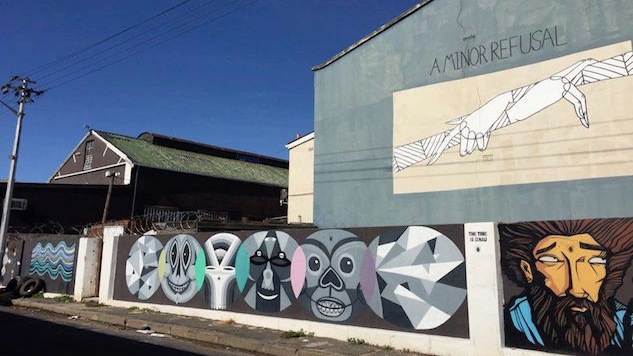 The former biscuit factory is tucked away on Albert Road, the main drag running through Woodstock, one of the oldest suburbs in Cape Town just south of the harbor and north of Table Mountain, about 20 minutes from the tourist-filled Victoria & Alfred Waterfront. Before a harbor was built in the 1950s, the neighborhood beckoned visitors to its cottage-lined beaches. Recycled wood from the same spot became resources for these warehouses to build furniture as the neighborhood took on an industrial edge. Now design shops in the Old Biscuit Mill are selling these beautiful wares alongside local artwork and some of the city’s best espresso and chocolate, drawing tourists away from the center to give them a glimpse of a more authentic side of the city. International and local artists are breathing new life into Woodstock’s abandoned buildings and rougher streets transforming the somewhat tired neighborhood into the most cutting-edge part of town thanks to a mix of street art, start-ups and artisan shops. On the V&A Waterfront you’ll find craft markets like Watershed, but these vendors start their Saturdays here at Biscuit Mill’s Neighbourgoods Market, sipping on freshly brewed coffee from Espresso Lab Microroasters and catching up over live music with blues and gypsy artists belting out tunes under the tents. Here, you can buy everything from curries and spices to bars of organic, raw chocolate from Honest, whose Woodstock warehouse sits just a few streets away. Step out of the comfort of the market you’ll get into the grittier side of the neighborhood where the locals hang, like Flat Mountain Coffee Roasters (a play off Table Mountain), where you can take a seat with your very own flat white coffee on the centerpiece 70s-style, mustard-yellow couch. After fueling up, get lost in the graffiti-covered side streets, with dozens of murals designed by artists like Tel Aviv-based Know Hope and Cape Town-born Faith47, who are using the sides of crumbling homes and buildings to make political statements through their art. Paintings of black and white plants climb their way up the sides of walls with sayings like “Living Entwined” to show that race shouldn’t be an identifying factor in the city. Other colorful graffiti-style pieces depict animals like rhinos that are slowly dying out due to the mass amount of poaching each year, using street art to shed light on this spiraling problem. Just as this living gallery is giving growth to the neighborhood, Miami’s Wynwood Arts District has been undergoing the same, stealing the spotlight from flashy South Beach. North of Downtown, Wynwood was once home to the city’s fashion and textile industry, nicknamed “Little San Juan” since so many Puerto Ricans set up shop here in the 50s with their restaurants and markets. In 2009, entrepreneur and real estate developer Tony Goldman, known for revitalizing so-called “neglected urban neighborhoods” saw Wynwood’s windowless warehouses as a blank canvas waiting to be covered. He started with just six buildings in a complex running from 25th to 26th streets, with the goal of bringing museum-worthy murals to the deserted spaces. Now the neighborhood is home to one of the largest living collections of street art on the globe, covering 80,000 square feet of walls with pieces from over 50 artists coming from 16 countries, including South Africa’s Faith47, who has contributed a number of work to the walls since 2012. The art not only revitalized the warehouse ghost town from the outside, over 70 shops, galleries, restaurants and bars have moved into the neighborhood since, giving rise to the pedestrianization of Wynwood’s streets and launch of the popular Second Saturday Art Walk. The block party takes place every second Saturday of the month with street food vendors, after party events and galleries opening their doors to the community. Europe’s not lacking in cities heavy on street art either, with big name artists like England-based Banksy, known for tagging social commentary on streets from Bristol to London’s Brick Lane. The port city of Marseille, however, was always known more for its soap and bouillabaisse fish stew than its street art. In the past few years, the hilltop neighborhood of Cours Julien has been modernizing the Provençal city’s appearance with its “here today, gone tomorrow” style of street art as more of these old school vendors lend their walls to artists. The square held the city’s wholesale markets until 1972, and since then the market gardeners’ warehouses have transitioned into the trendiest concept shops and terraces in town, making it the spot to hit come Saturday night for the “bobo chic” set. Two years ago, Cours Julien kicked off its first street art festival, a free event with exhibitions, markets, performances and new street art displays, ending with DJ-driven beats on the street each evening for a French-style block party come summer.